Jarena Lee was the 1st woman to preach under the auspices of the AME church. The child of free black parents, Lee was born in New Jersey in 1783, & worked as a servant in the home of a white family, 60 miles from her home. Strongly affected when she went to hear Richard Allen preach, Lee determined to preach herself. At first rebuffed by Allen, who said that women could not preach at the Methodist Church, Lee persisted; & 8 years after his initial refusal, Allen allowed her access to the pulpit after hearing her spontaneous exhoration during a sermon at Bethel AME Church. Lee traveled all over the United States preaching her gospel of freedom, even venturing into the South to preach to slaves. The following is a segment of her journey written in her own words. I now travelled to Cecil country, Md., and the first evening spoke to a large congregation. The pastor afterwards baptized some adult persons - and we all experienced the cleansing and purifying power. We had a baptism within and without. I was next sent for by the servant of a white gentleman, to hold a meeting in his house in the evening. He invited the neighbors, colored and white, when I spoke according to the ability God gave me. It was pleasant to my poor soul to be there - Jesus was in our midst - and we gave glory to God. Yes, glory - glory be to God in the highest. "God forbid that I should glory, save in the cross of our Lord Jesus Christ." I boast not myself. Paul may plant and Apollos water, but God giveth the increase. I tried also to preach three times at a place 14 miles from here - had good meetings - backsliders were reclaimed and sinners convicted of sin, who I left in the hands of God, with the hope of meeting and recognizing again "When we arrive at home." Returned back to Middletown. The next day the preacher of the circuit conveyed me to his place of appointment at Elkton. We had a wonderful outpouring of the spirit. At Frenchtown I spoke at 11 o'clock, where I realized my nothingness, but, God's name he praised, he helped me in the duty. Went again to Middletown, and from there to Canton's Bridge, and talked to the people as best I could. Seven miles from this place I found, by the direction of a kind Providence, my own sister, who had been separated from me some thirty three years. We were young when last we met, with less of the cares of life than now. Each heart then was buoyant with mildly hopes and pleasures - and little did we expect at parting that thirty three years would pass over us, with its changes and vicissitudes, ere we should see each other's face. Both were much altered in appearance, but we knew each other, and talked over the dealings of the Lord with us, retracing our wanderings in the world and "the days when life way young." During this visit I had three meetings in different directions in gentlemen's houses, and a prayer meeting at my brother's, who did not enjoy religion. My good old friends Mr. Lorton happened to be there, who told the people that she had been to my house - that he knew Mr. Lee (my husband) intimately, and that he had often preached for him while pastor of the Church at Snow Hill, N.J. I next attended and preached several times at a camp meeting, which continued five days. We had Pentecostal showers - sinners were pricked to the heart, and cried mightily to God for succor from impending judgment, and I verily believe the Lord was well pleased at our weak endeavors to serve him in the tented grove. The elder in charge, on the last day of the camp, appointed a meeting for me in a dwelling house. Spoke from Acts ii, 41 The truth fastened in the hearts of two young women, who, after I was seated, came and fell down at my side, and cried for God to have mercy on them - we prayed and wrestled with the Lord, and both were made happy in believing, and are alive in the faith of the gospel. The next morning a brother preacher took me to St. Georgetown. From, there I took stage to Wilmington, and called on my friend Captain Rial, in whose family I spent two days and nights. Went to Philadelphia to attend a camp-meeting. Returned again to Wilmington - where I was taken sick with typhus fever, was in the doctor's hands for some days - but the Lord rebuked the disease, gave me my usual health again, and I returned back to Philadelphia. 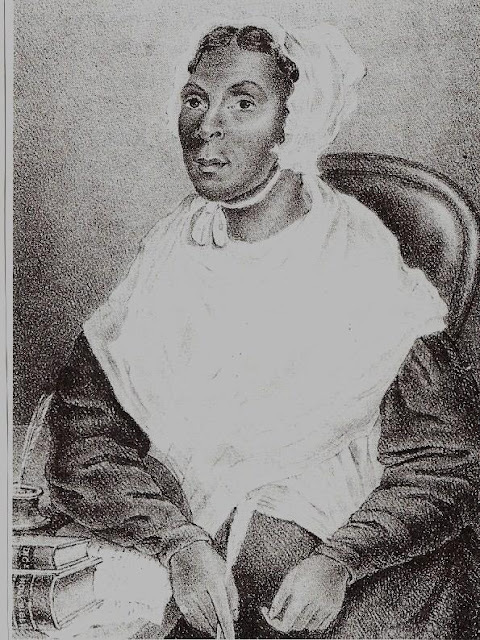 Jarena Lee (1783-1857) was an evangelist for the AME church in the first half of the 19th century. In 1816, Richard Allen (1760-1831) and his colleagues in Philadelphia broke away from the Methodist Church and founded the African Methodist Episcopal Church, which, along with independent black Baptist congregations, flourished as the century progressed. Richard Allen allowed women to become evangelists and teachers but not church leaders. Jarena Lee was the 1st female to preach in the African Methodist Episcopal denomination. Born in Cape May, New Jersey, she moved to Pennsylvania, when she married in 1811. She had felt called to preach as early as 1809, & revealed her wish to church leader Richard Allen, who responded symapthetically, but explained that the AME Church was silent on the question of women preachers. In 1817, an "ungovernable impulse" led her to rise in Bethel Church & deliver an extemporaneous discourse that so impressed Bishop Allen; that he publically apologized for having discouraged her 8 years earlier. With this verbal liscense from the bishop, Lee began her evangelical ministry, traveling hundreds of miles, often on foot, to preach before all races & denominations, at churches, revivals, & camp meetings. She traveled as far west as Ohio. Although she was never officially licensed & never organized any churches, her ministry aided in the rapid growth of the AME Church before the Civil War. By 1846, the A.M.E. Church, which began with 8 clergy & 5 churches, had grown to 176 clergy, 296 churches, & 17,375 members.